The budget accommodation where is next station to Tokyo Narita Airport. Hotel(Hostel) for Backpackers and Traveler's in Japan. The budget priced but stylish Hostel is one stop away from Tokyo Narita Airport. You can come directly and stay with us without booking. Pick-up our flyer at Tourist Infomation, Narita Airport. International Guesthouse AZURE is located in Narita in Chiba, Japan. Our location is very convenient for those coming and going through Tokyo Narita Airport (NRT) of the main gate of Japan. If you are interested in J-tradition, there are many interesting places not written on the guidebook, you must enjoy Narita and worth visiting at first or last place of your travel in Japan. Please check here out. You also can make a reservation or pick up our flyer at Tourist Infomation Center in NRT and come directly without booking. "If You Need Travel Tips NOT On The Guidebook... "
It takes only 7 minutes by train (one stop away) from Narita Airport. We have free brochures from all around japan to help you find the next place to stay and information on the best way to get there. 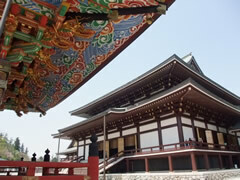 There are lots of sightseeing spots, many traditional ceremonies and festivities around the Narita area. so you can enjoy Japanese culture from your first step in Japan. Please read our website about more details !! How long do plan to travel around Japan? If you are staying for less than one week in Japan, We can help you to travel more efficiently. we can show you the best routes to take. And also if you are looking for anything in particular such as a Unique store or gift, we can help you search for it! *We can show your best route from Narita. Bike parking OK !